Prime Property is another great 5-reel, 40 pay line bonus slot from the folks at Microgaming. You can wager from 1 cent to 25 cents, with up to 5 coins per line for a maximum bet of 200 coins. The reel symbols include several real estate tycoons, Mike, Joanne, Peter and Lily along with a Mansion, Villa, Summer House, Double and Single Story properties. Each pays out when a set of 3 or more like symbols stop on a covered payline. 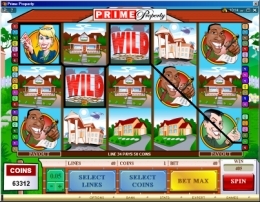 Add in the the Prime Property wild symbol to further complete winning combinations. Plus just 2 Prime Property symbols pays 25. Get all 5 and you win the top prize of 12000 coins times the number of coins wagered. However, no slot game is complete without scatters. In Prime Property the scatter symbol is a Movers Truck, with the words "Move It" painted across the back. Get 3 "Move It" scatter symbols and the total number of coins bet is doubled. Get 4 and your total bet is multipled by 20. Get all 5 and the multiplier jumps to 100 and with just a single coin wagered on each of the 40 paylines would net a payout win of 4000 coins. If you like free spins you've got a winner in the Prime Property bonus round. The bonus round is activated when 3 or Morning Paper symbols stop anywhere on the reels. In the bonus round you keep selecting houses. Each house selection either reveals additional free spins or a multiplier value. Pick wisely and you could end up with 40 free spins at 8 times your coin wager. You keep picking until you get a start free spins house. Although the free spins can not be retrigggered you are guaranteed at least 1 free spin and a 1 multiplier for just 3 Morning Paper symbols and that doubles for 4 and triples for 5. Prime Property is loads of fun to play and even wagering just 5 cents per payline results in some decent bonus round wins. Phoenician Casino offers over 194 different video bonus slots, including 20 progressive jackpots and table games. Register as a real money player you automatically become a member in their loyalty program where you can accumulate and redeem points for real cash. Get up to $1200 in their triple bonus signup offer! A 50% matching bonus (up to $50 FREE) on your first deposit, a 25% matching bonus (up to $200) on your second deposit and a 20% matching bonus (up to $950 free) on your third deposit. If you plan on playing this casino many times it could be a good deal as most signup bonus offers are for first deposits only. 24/7 toll free support. Game software by Microgaming Viper. Credit and Debit card, EcoCard, e-Check, Click2Pay, NETeller, FirePay, Wire Transfer, MoneyBookers, Citadel Commerce, UseMyBank, EziPay. Under banking on the home page is a "deposit helper" that provides detailed instruction on using each method.